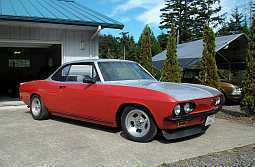 Rod, original Endplay measurement was wrong.... was done using the HB outer ring while engine was in the RS. Outer ring came off by hand after engine was removed. And it never wobbled when setting timing......while the engine "knocked". Oil filter has not one scratch! Matt did you look into the engine today? OR maybe better question is: did you discover anything that would make the noise? Naw, busy with other things! So far only the rotated pistons... Bellhousing off next.... it appears to be an EM and Crank flange sticks out further than 1/8". 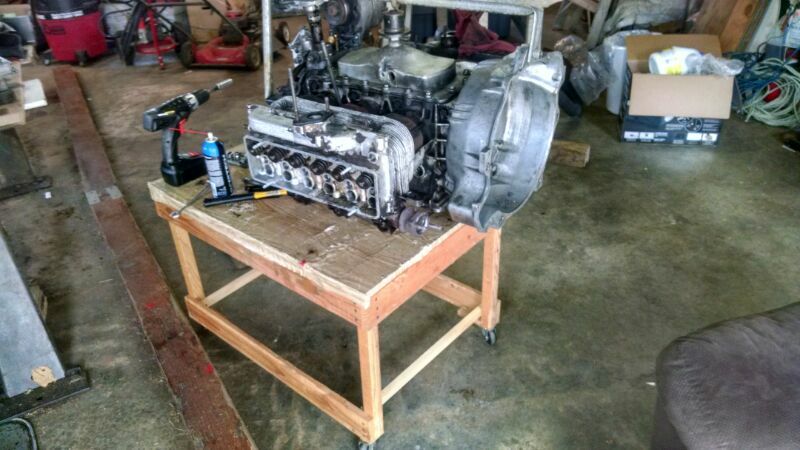 After I check both ends and rotate the pistons I'll run it again....then if it still knocks... split the cases.. I cannot believe it could make that much knocking.. Correction.... Ed did run it with only the inner ring...... knocking the same.. Early B/H , late cam no witness marks... all looks good... 8409 must have the early crankgear...good 0.250" space between end of teeth and Flange..
Other head tomorrow... upper nuts soaking overnight! Right... out west... We removed one stud yesterday... short soak...no heat used..
We all seem to have missed it! Does anyone else see what appears to be brass shim stock under the seat? When it knocked... no miss.. no Valve train noise.... ONLY the fanbelt would vibrate... Compression even in all 6. no blowby problems..
Edited 1 time(s). Last edit at 08/09/2018 05:07PM by MattNall. In the last year 500 miles approx... 60-70 sometimes... only knocked at idle to 1300 rpm... and not always..
To back up a bit, you think it has an Early gear on a Late crankshaft? How does that affect the flywheel/pressure plate/release bearing/pivot bolt recipe? Valve seats that come out and go back in are mysterious. I had one last year that would come out when blipping the throttle but stay in with steady acceleration. A friend called when on a trip to Oshkosh describing the same scenario, he made it back to Grand Marais by taking it easy. Nope!! I was just asking. Being retired we are in no hurry..
Couldn't find anyone to repair the head.. so I sourced a replacement. Put everything back together...waiting on head.. then I'll fire it. The engine should have developed a miss when the seat ring was out of place then smoothed out when the ring worked itself back into the hole. 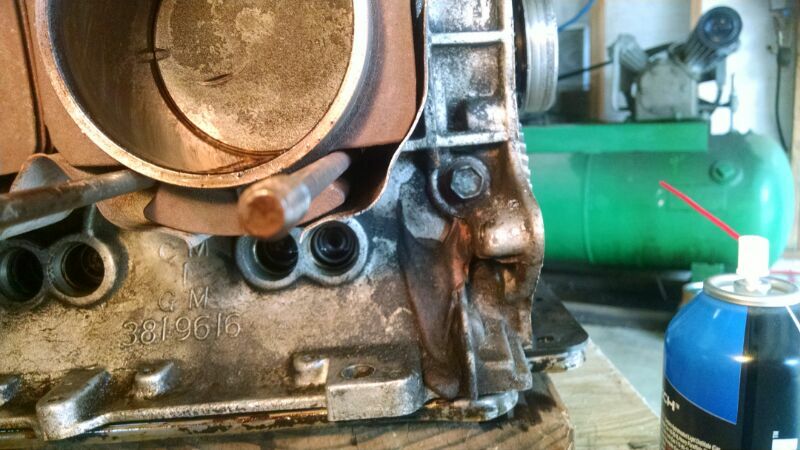 there might not be quite enough clearance between the piston and head. 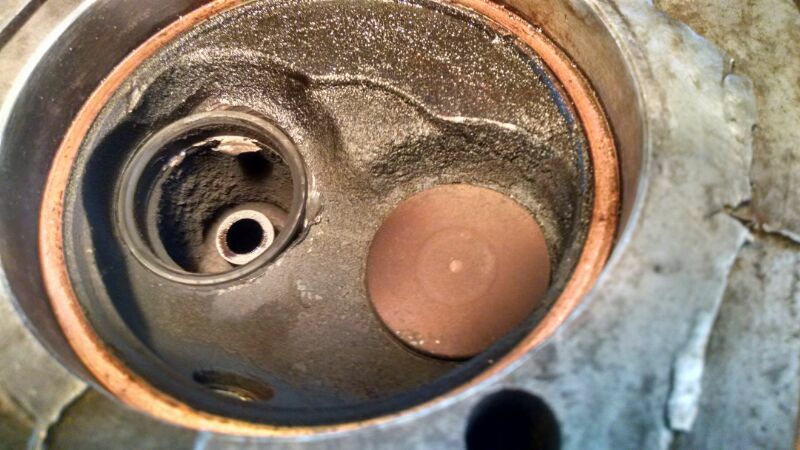 I found in the past that I could get some noise if I had a .030" nominal clearance between the piston and head, as carbon deposits could fill that gap and cause a "hitting"
sound. 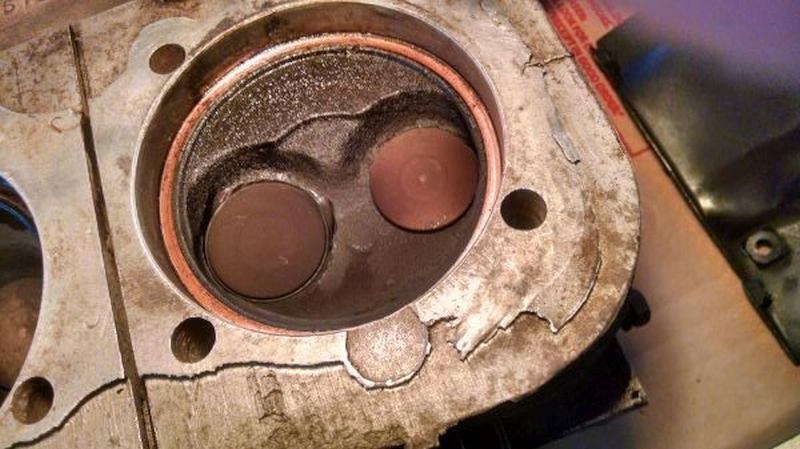 I've talked to one person that had an engine where the valve seat was actually stuck to the valve and moved with it, and never had any noise and had no obvious symptoms of a dropped seat except for some engine roughness. > the ring worked itself back into the hole. Right! but no valvetrain noise either! Only roughness was the fanbelt shook when banging... shorted each cylinder when idling / banging and all were equal! Edited 1 time(s). Last edit at 08/11/2018 08:27PM by MattNall. > flywheel/pressure plate/release bearing/pivot bolt recipe? We do! Although clutch worked and still works flawlessly ... there is a witness mark on the Clark's replacement 2 seal snout. Received $20 head at 1 pm... on by 3!, busy the next few days so may not fire until Fri.?? > Received $20 head at 1 pm... on by 3! 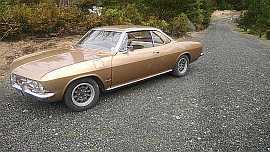 You received a ready to install, no valve grind, no valve guide or seal head for $20? Where are these deals when I'm in need? It would be foolish at this point to overlook excessive end play. As he said, it had the vibration/noise with the fan belt off. You need to keep looking and not because of any "while I'm there" thinking. This is not a couple of newbies... 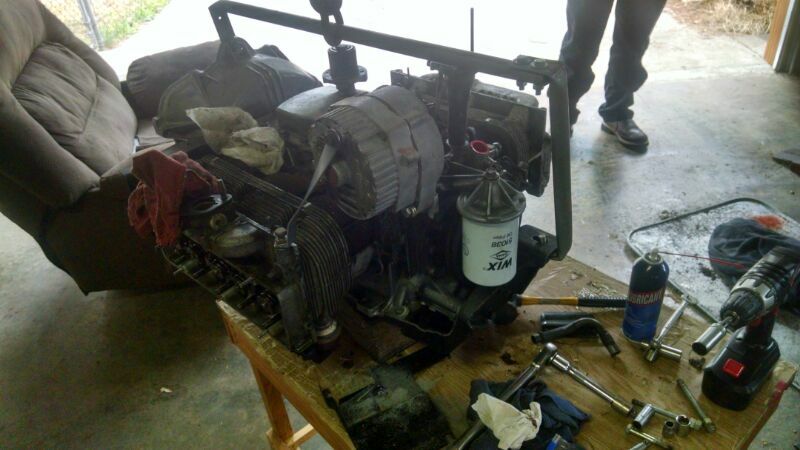 I've been repairing Vair engines since '63 Only had Dunecars until '74. Ed is a SBC builder... and has lots of experience with Aluminum. This noise did not sound like a valve hitting a piston... and was only below 1300 rpm.... strange for sure! I've been using this as a "Mystery" for hopefully someone to guess correctly the cause..We sure didn't! Edited 1 time(s). Last edit at 08/15/2018 12:42PM by MattNall. OK, I looked back, again. Now, show me where it says someone rechecked the endplay. Edited 2 time(s). Last edit at 08/15/2018 01:25PM by Richard. > Today's find. Flange is eighth inch too far out! > out it's in spec! I must've texted that to someone and forgot to post it here! "oops"